The color of my Lucuma "Ice Cream" is not as orange as some I've seen-- maybe because it's made with the powder. "Lucuma is a Peruvian fruit and, as many of you may know, my father was Peruvian. I remember lucuma ice cream from my three months in Peru as a six-year-old. Lucuma is a fruit with a quite dry texture, so it isn't eaten as a fruit, per se. 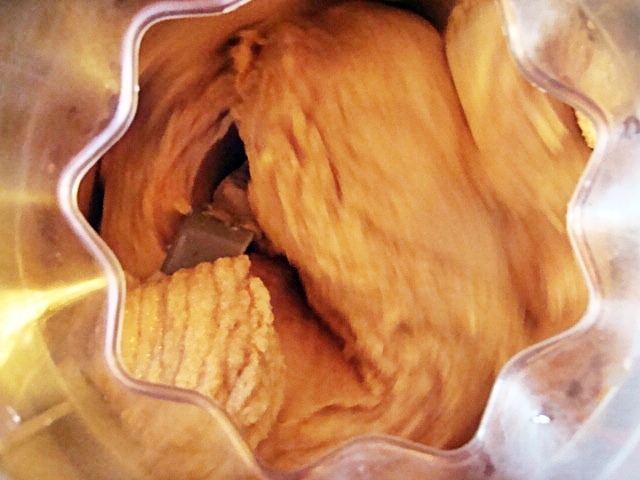 Mostly it is used for a delectable, rich ice cream. Lucuma is rather sweet and has a butterscotch-y sort of flavor. When I was in Vancouver last, I found a store with Peruvian foods and bought some frozen lucuma puree-- what a coup, I thought! ... I worked out a recipe based on my vanilla gelato recipe made with Instant Clearjel, with the help of a (non-vegan) recipe from the internet. After splattering the kitchen with soy cream after a little accident (Mercury is in retrograde-- what can I say? ), I made the mix and tasted it-- WAY too sweet!! I couldn't figure it out! 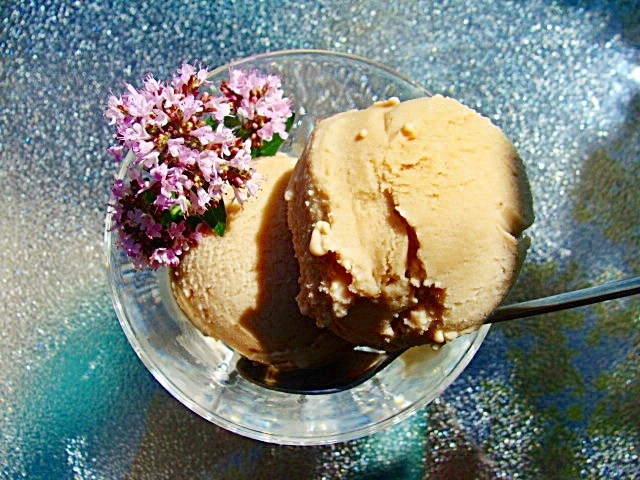 My gelato is not as sweet as most, and I had used less sweetener than the non-vegan recipe called for (in relation to the volume of liquid, etc.). So, I got out my (new, under-used) reading glasses and read the small print on the bag of lucuma puree-- sugar! I had been assuming that it was unsweetened, since the label did not say "sweetened" and the recipes I found online all called for unsweetened puree. My mistake! I tried diluting it with more soymilk-- still overpoweringly sweet! ... So, I started over and used no sweetener at all. It still tasted too sweet to me, but I know that when food is frozen, the sweetness is not as apparent, so there was hope. I stuck it in the freezer and hoped for the best, as I was hoping to take it to a family dinner with my sister and my mother on Friday-- they will remember this treat, too! Last night I looked for unsweetened lucuma puree in Canada online-- no luck. But I did find lucuma powder . It seems that lucuma is all the rage in the raw foods community and is even used as a natural sweetener. I found some at a good price from this Canadian vendor, and ordered 2 lbs for future experiments! BTW, lucuma is being called a "superfood", but I think this is somewhat of an exaggeration. It's true that it has lots of fiber and beta carotene, but, then, so do carrots! It is high in natural carbohydrates, so it was used by the Incas to provide energy, and evidently the trees are very prolific-- no wonder it was a popular food. Tasting sweet and butterscotch-y didn't hurt! I just feel that we should not go hog wild over exotic foods that are supposed to provide miraculous nutrients, when, in fact, we have foods at home that are just as good, more available, and much cheaper! For me, this is an exotic treat to relive some childhood memories. 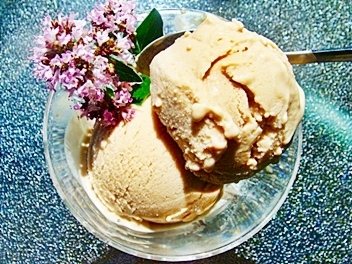 Anyway, that said, we tried a bit of the ice cream when I was photographing it and re-packing it, and it is delicious! 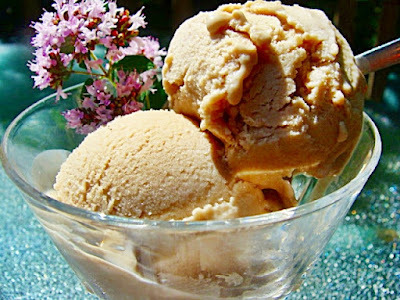 I will give you the recipe I used with the sweetened puree, but I plan to try it again with the lucuma powder and will report back!" Well, I finally got back to that recipe yesterday, almost a year later, and I think I've got it! 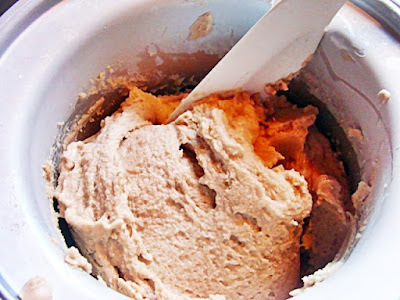 I made this version with the lucuma powder, basing it on my Vanilla Gelato using Instant ClearJel, but I omitted the syrup in the recipe because lucuma powder is fairly sweet on its own. I added a little more nondairy milk to compensate for the liquid in the syrup. It's not as good as the original made with the fresh fruit, of course, but it's not overly-sweet, and you can really taste the "butterscotch-y" flavor of the lucuma. 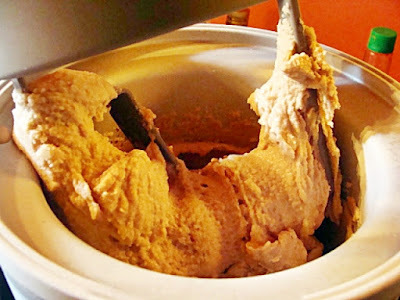 I hope you will try this vegan version of a popular Peruvian ice cream! UPDATE: See this post for take #3. Place the 3 3/4 cups milk into a blender along with the soaked, drained cashews, and blend until VERY smooth and frothy (make sure that it is not grainy at all). 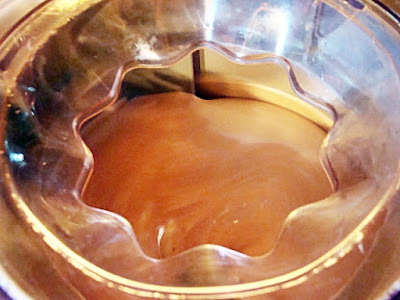 Mix all of the remaining ingredients, into this mixture and blend again until it is VERY smooth. 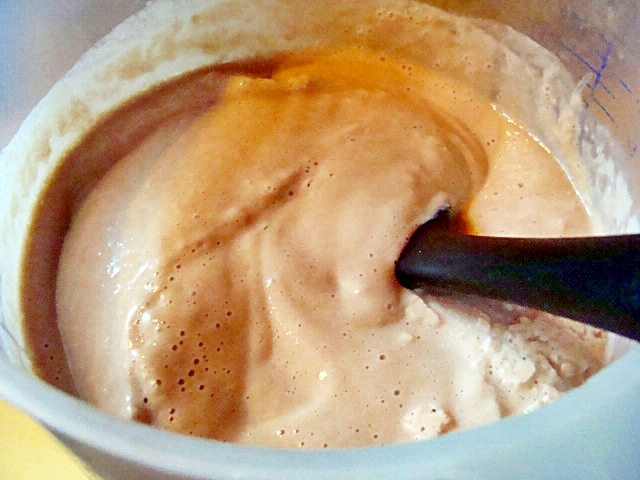 Chill the gelato mixture thoroughly, and then freeze according to directions for your ice cream machine. Scoop into freezer container(s), cover and freeze for several hours before serving. Nutrition (per serving): 208.2 calories; 24% calories from fat; 6.1g total fat; 0.0mg cholesterol; 125.9mg sodium; 68.1mg potassium; 34.1g carbohydrates; 0.3g fiber; 18.9g sugar; 33.7g net carbs; 5.0g protein; 4.6 points. The machine in action just before stopping it. YUMMY! This looks sooo good. Yaelian, you are right, but, unfortunately it's what we have to work with. I'm going to do some more experimenting to do better, but it is still delicious in its own way! Hooray! My copy of World Vegan Feast was just shipped. I opted for the free shipping so it will take a week or so. But it is on the way! Congratulations, Bryanna! My copy is also on the way, Joanna. Can't wait!